The SBU chief suspects a Russian plot. The Security Service of Ukraine (SBU) will give a legal assessment to the Moscow visit of presidential candidate Yuriy Boyko and the head of the For Life party's political council, Viktor Medvedchuk, and the statements they made there. "At the same time, we do not rule out a possible indirect connection between this event and an averted terrorist act in the Kharkiv subway," the SBU press service said on Facebook. SBU chief Vasyl Hrytsak said the available information shows that Russian special services are trying to distract public attention from the exposure of corrupt financing schemes used by one of the Ukrainian presidential candidates with whom "the Kremlin was and is pleased". "For this, while forfeiting the little things, Russia is doing its best to push the SBU to 'switch to an unwanted object', using special services' terminology, to help those with whom Vladimir Putin is personally pleased to come to power," Hrytsak said. 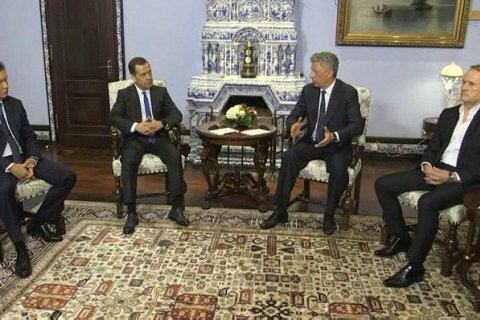 Boyko and Medvedchuk came to Moscow to meet Russian Prime Minister Dmitry Medvedev and Gazprom CEO Alexei Medvedev, slightly more than a week before the presidential election in Ukraine.